WinFax PRO was award winning fax software developed in the early 1990s. Back then, dial up internet modems and faxing capability were included on most computers. Today, most communications is by e-mail or text and faxing is not as common place as it once was. There are many businesses and organizations that require faxing capabilities and this is especially true in the health care and legal industries. If your business or organization requires faxing, you probably have a fax machine somewhere in your office connected to a fax line. Receiving, sorting and printing faxes can be time consuming and expensive. 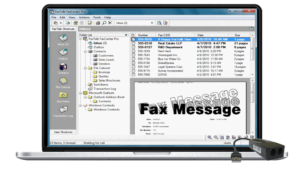 FaxTalk fax software is a great choice as a replacement or to complement your existing fax machine. FaxTalk software supports the latest operating systems including Windows 10. You’ll also find the operation of FaxTalk is similar to that of WinFax, so you don’t have to learn new and complicated software. FaxTalk provides a cost effective method of sending and receiving faxes. Online fax services charge you for each fax, and they usually charge a monthly service fee. There are no monthly fees with FaxTalk. Your faxes are transmitted using your own telephone lines and faxes are never routed via the public internet mail system (unless you choose to forward your faxes via e-mail). Thousands of small and medium sized businesses, legal organizations and health care practitioners around the world use FaxTalk to send and receive faxes with ease. FaxTalk can import your existing WinFax phone books, so you don’t lose your data or waste your time manually re-typing important data. The import process is a simple task of clicking on “File, Import” when you have WinFax and FaxTalk installed on the same computer. We also provide instructions on performing the import if using two different computers. FaxTalk can also import your old faxes from an existing WinFax PRO installation. You can store your attachments in a folder called the FaxTalk File Cabinet. Do you have old data on a drive with WinFax PRO faxes or phone books? We can recover and convert data from WinFax databases and FXM, FXR, FXS fax files. Contact us for our rates. Existing fax modem not compatible? FaxTalk requires a fax modem connected to a telephone line. We can provide you a fax modem that is compatible with your operating system. The fax modems we offer all tested for use with FaxTalk software. Download a fully functional 15 day trial version Click here for more details on downloading your free trial version of FaxTalk software. Use FaxTalk software discount coupon code GREAT10 to receive 10% off retail when you buy at the GetFaxing.com on-line store.